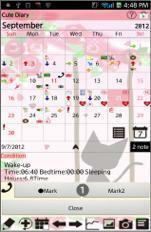 Save and manage daily events and health conditions just by tapping a pensil (Event) button on the calendar! 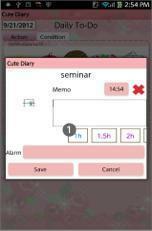 A Timetable function for students! It can be used in a different way as well! You can use it as you like! Save notes with tag names and sort them to folders! Use it as to-do list! 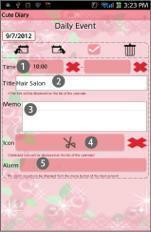 Handwriting Memo function for a quick memo or to share an image with a memo with your family and friends! 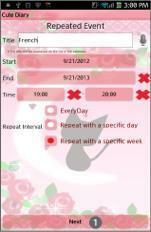 Manage also daily and repeated plans so you can use as an organizer! 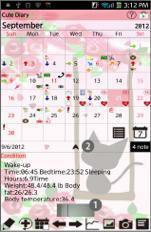 This is a multifunction app but very simple to use! ＊Cute Day Planner does not sync with Google Calendar. Added a new backup function Export Cloud! You can save, send and retrieve your data by using "Gmail" and "Google Drive". Please click Backup button above to check the description. Added a new backup function "Export Cloud"! 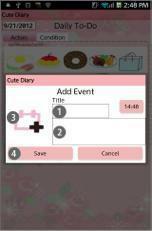 ❶ Setting: Set the basic functions of the app. ❷ Password: Set the password. ❹ Copy to SD card: Copy the data to internal and external SD card. ❺ Recovery: Use this function when you want to return to the previous data. ＊Please note that the current data will be deleted when you use this function. ---❶ Search: Search events by keywords. ---❷ Alarm: Set the sound and the volume. 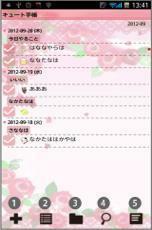 ---❸ Mark: You can add marks on the date of the calendar. 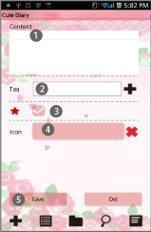 ---❹ Setting Mark：Customize the mark list. Tap here to set a password! 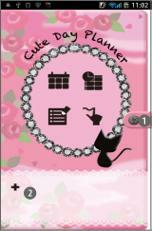 Tap ＋ button to add another apps to use them while using Cute Day Planner. 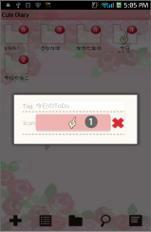 When tap ② (＋ button), you see this process. You can see all the apps you have installed on your mobile. Tap one to add. Confirm here added app. Add more apps in the same way. Drag the app to delete. 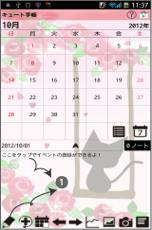 Select a day then tap ① on the calendar. Move to "Daily To-Do". Tap "Action" tag of "Daily To-Do". You can see the list of the default event icons. Let's tap "Medication" icon as a sample. A pop-up "Medication" appears. the upper right button shows the time you tapped the icon. You can change the time for example, the time when you have to take the madication or the time you took the madication. X button is to clear the time when you don't need to save the time. Tap "Save" to finish and go back to the calendar. You can confirm saved events on the list of the calendar. 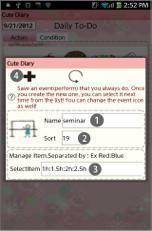 You can save more events in the same way. When you want to save an event that does not have on the list, but not want to register a new event icon on the list, tap "Add Event" icon. Enter the title name, change the time (if it is necessary). Tap here to change the icon. Tap "Add" button. A pop-up appears. Add：add a new event icon and save with this button. Back：go back to Daily To-Do. Select the sort. If you save 999, the icon will be added at the end of the list. SelectItem：You can create subcategories here. 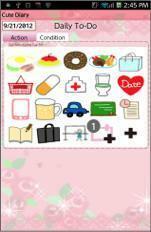 This is the example of subcategories. 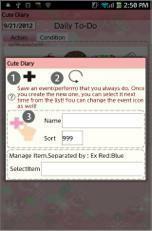 Customize the event list as you like! You can save records here just by tapping each buttons! It is very simple! You can save, Wake-up time/Bed time/Sleeping hours/Conditions(face icons)/Weight/Fat rate/Temperature (the basal body temperature)/Blood pressure/Pulse and Memo. Each item can be displayed by a graph (Tap "Graph" button on the calendar.). Tap "Repeat" button on the calendar. ＊When you want to edit repeated plans, come back to this page then select an event you want to edit from the list. This is a sample data. Here, we make a plan with specific weeks. When the plan repeats every week, you don not need to change anything here. 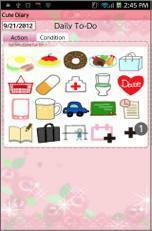 Select an icon for the plan. 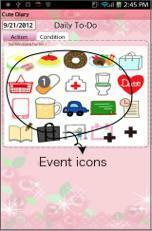 The selected icon will be displayed on the date of the calendar. Set the alarm.Tap "Save" to finish. 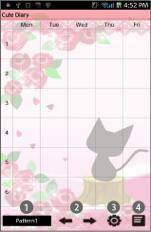 Select ① to create irregular repeated plans very easily! Select the number of the days. 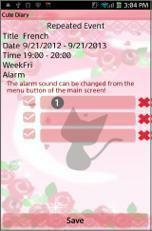 Tap "Next", select an icon for the plan and set the alarm. Tap "Save" to finish in the end. Let's create repeated plans in the same way! 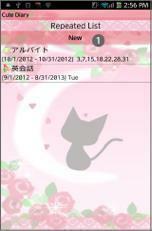 ＊Delete repeated events on 「Repeated Event」window. 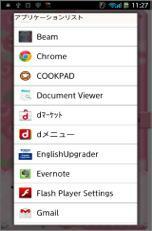 Can't be deleted on 「Event」window. Today butoon: Go back today's date. Left & Right button: Move the date right to left. 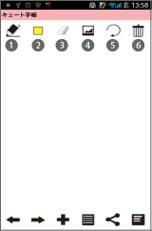 Graph button: You can see graphs of Daily To-Do. 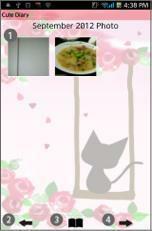 Photo List button: Move to Photo window. 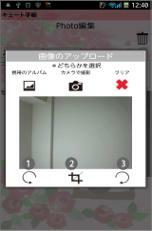 Camera button: Take photos or select photos from the gallery of the mobile. Menu button: Move to another apps or another windows. Tap one of the photos that saved on the calendar (You can see small sized photos above of calendar's buttons). Tap ② to see the photo better. You can see the event list in a full screen. This is very convenient when you want to see all the events of the day. Share button: You can share the photo. 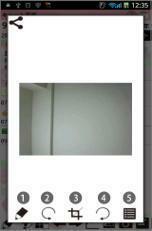 Tap ① Pensil button！to move to "Photo Edit"! Open the calendar. 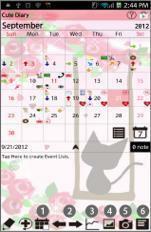 After saving events, you can confirm the saved events on the list of the calendar. Tap one of the events from the list. Move up：Move the event to the previous day or before. Put off：Move the event to the next day or later. 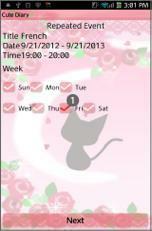 Checkmark：Tick the checkmark here then a red checkmark appears on the event of the list on the calendar. You can understand the event has done at a glance. ＊The window is a bit different when select "Sports" event. 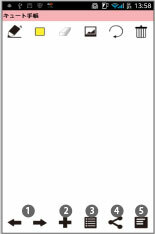 Change the content of the memo. Set the alarm. You can set the alarm in either way! Send this event by email. 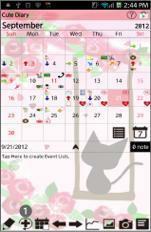 Tap "Photo List" button on the calendar. Tap one of the photos to move Photo Edit. Turn over the album cover to see the photos. Press Menu button of the mobile, then select "Mark". Press "Menu" → Select "Mark". Add marks you want on the date. Tap either Mark or Mark2, select a mark then tap the date. Select the same mark you want to delete and then tap the mark. Change the pattern name. You can make up to 3 patterns. Move the patterns back and forth. Move to another apps or another window. 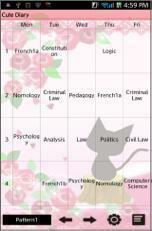 The sample of a timetable for a university student. You can use the timetable in a different way as well. 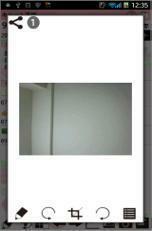 To organize reservation for a private teacher for example, you can use it as you like. List：See the list of the notes. Search：Search a note with a keyword. Menu : Move to another apps or another window. Enter a tag name. When you have already saved tag names, and when you want to use the same tag name for the note, tap ＋ button to see the list of the tag names. Tick here when it is important. 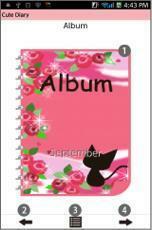 A star mark will be appeared on the right of the note list. 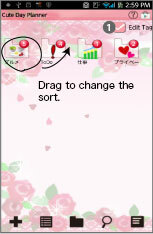 Drag a folder to change the sort. Tick the checkbox then tap a folder. ＊When you want to delete a folder, you have to delete all the notes in the folder first. Tap "List" button →Tap the note you want to delete→Edit→Delete→Tap OK. Repeat this until the folder will be empty.→Move to Tag Folder→Tap the folder you want to delete→Delete. You can select an icon for the folder. Select a background image from the gallery. Move the memo back and forth. The list of the memos.